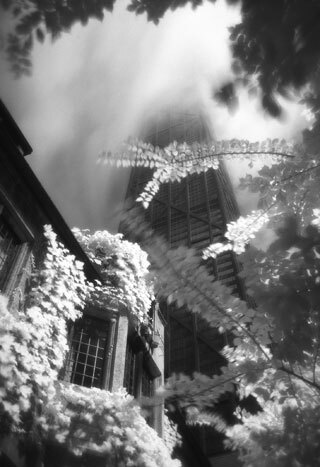 My project "Chicago - in contrast" is my second project shot entirely with a Holga camera on infrared film. As the title suggests, this project highlights some of the wonderful contrasts found within the urban image: constant movement and change vs. tradition and monolith, light vs. shadow, form vs. randomness. The contrast I found most intriguing though is the one we see every day, and all day: the play between nature and structure. The fleetingness of clouds and sky along with the natural beauty of the city's flora provide for an incredible contrast to the monolith of concrete and steel, each one in stark contrast and yet at the same time such a beautiful complement to the other. These contrasts are further dramatized by the extreme tonal differences inherent in the infrared image itself. My traditional Chicago images are a collection shot throughout the city using my Mamiya 7II medium format camera as well as a 35mm camera.